A dangerous activity on a construction site is smoking. 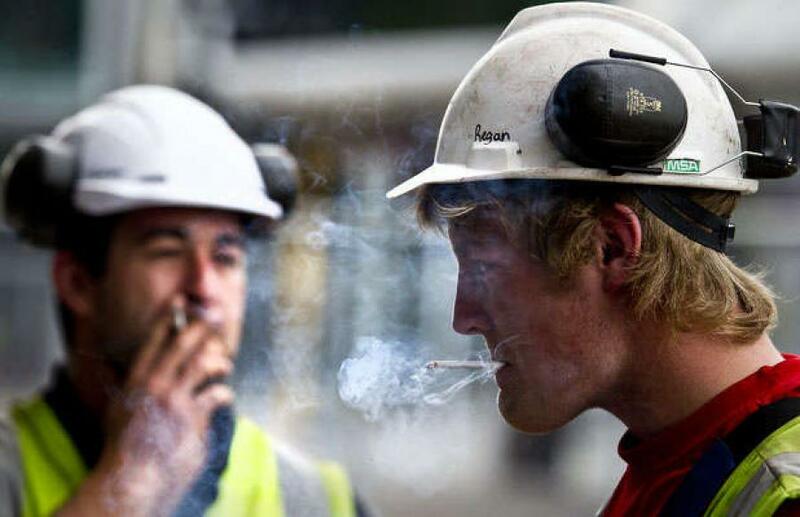 Make sure construction workers are not smoking while on the job or smoking only in approved areas. If you smoke, be sure to dispose of butts properly. Haphazardly throwing cigarette butts on the ground can lead to fires, especially on construction sites where there are a lot of fire hazards. If smoking is a problem on your job site, make sure that you have no smoking signs posted in locations that are clearly visible. Instruct your employees not to smoke and enlist your site’s fire safety manager to enforce the no smoking rule. While working, it can be easier to throw construction waste and debris into a pile that you plan on cleaning up later. However, a pile of debris is a great source of fuel for a fire. Make sure that when you are working you immediately put all waste into the proper garbage disposal or dumpster. Also, be sure that dumpsters and garbage cans are a safe distance away from heat sources. One way to greatly improve your fire safety is to train employees thoroughly on what to do in the event of a fire and methods to take to prevent a fire. Train employees to look out for fire hazards and have them report the hazards if they see any. Teach workers how to operate fire extinguishers and be sure everyone knows the location of the extinguishers. Workers should know the evacuation route and at least two possible exits to get out of a burning building. One of the top safety violations on construction sites is temporary electric systems. Having many extension cords and power strips connected together can be dangerous. Before using extension cords, check for signs of wear. Do not use extension cords that are falling apart because they are higher risk for starting a fire. Do not connect multiple power strips together. It can create a power surge that sparks a fire. The use of flammable liquids such as gas, diesel, and propane is common on a job site. Be cautious when using flammable substances. Become familiar with the Material Safety Data Sheets before handling these materials. Make sure flammable liquids are stored in the correct containers and keep them a safe distance away from source of heat. Performing hot work such as cutting, welding, burning, and grinding is a necessary but hazardous task on a job site. Performing unsupervised hot work or not getting the proper training can lead to unintentional fires. Have a fire safety manager on your jobsite to supervise all hot work and make sure it is being done properly. At Total Safety Consulting, we have a fire division that is dedicated to promoting fire safety on job sites. Our team of FDNY and NYPD professionals can provide our clients peace of mind on a construction site with their fire knowledge and experience. We can also provide site safety managers for you that will also act as a construction site fire safety manager. Having a fire safety manager may be required for your construction site to oversee hot work operations and enforce the proper storage of flammable material. They are also responsible for enforcing fire protection devices on the job site. Total Safety Consulting also has a training academy that provides courses on a variety of safety topics, including fire safety training courses.